The new expanded Live 2 Break crew! “Happiness. Joy. Hope. Those are the words I would use to sum up the last 10 days at Les Enfants de Dieu. If there is one thing my boys love more than anything else in the world it is to dance. Sun up to sun down they will dance. As soon as they get the chance the boom box is rocking and they are grouped together in synchronized routines. Many an afternoon, I have spent twirling in circles, shuffling from side to side, and getting down with the boys in our dining room as the music cracked in and out on the sketchy stereo. So much joy has come to the center through dance, a language and an understanding that needs no words. So of course if they had one wish it would be to have real dance teachers, not just the pirated music videos they watch to perfect their skills. Thank god for Catalyst Rwanda and the Live 2 Break Crew who came and spent the last ten days teaching the boys to pop, lock and drop it. As I watched the boys transform into break dancers this last week I felt so happy. Their smiles never faded and their eyes lit up every time Pervez (the break master) tied his bandanna on and showed them a new move. Each time Kate or Bret (the rest of the crew) slowed down to help a boy until he got it, I saw that glint of pride radiate from his soul. This week the boys saw that they mattered. The Live 2 Break crew had come all the way from London just for them because they are just as important as any other child. They will never forget those ten days, they will treasure them forever– just as I will cherish the moments I got to sit and watch them smile as they spun in circles and hopped back in forth. 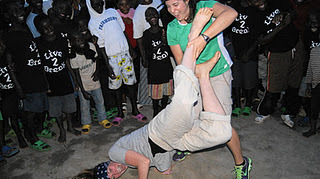 Claire & Elaine invent "pairs breaking"
Kids love to dance and are eager to learn new styles and forms of dancing. 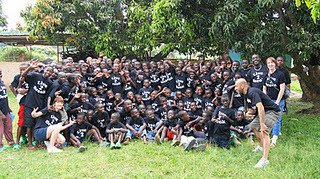 The small workshops like Catalyst Rwanda and others will give them a chance to learn new styles with proper training and techniques.